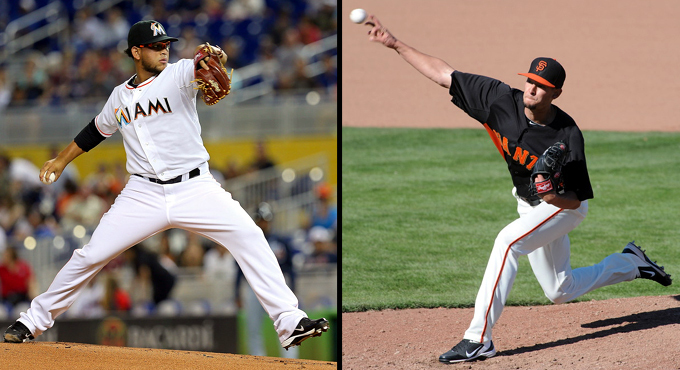 (Central Islip, N.Y., July 14, 2017) – The three-time Atlantic League champion Long Island Ducks today announced the signings of right-hander pitchers Henderson Alvarez and Jake Dunning. Both begin their first season with the Ducks, with Alvarez entering his 11th season of professional baseball and Dunning in the midst of his ninth. Alvarez spent five seasons in the Major Leagues, including two years with the Toronto Blue Jays (2011-12) and three with the Miami Marlins (2013-15). In 92 career starts, he compiled a 27-34 record with a 3.80 ERA, five complete games, five shutouts and 296 strikeouts over 563 innings of work. The Venezuela native was selected to represent the National League at the 2014 MLB All-Star Game in Minneapolis. That season, he led the NL with three shutouts and compiled a 12-7 record with a 2.65 ERA, three complete games and 111 strikeouts. The 27-year-old’s big league career was also highlighted by pitching a no-hitter for the Marlins on the final day of the 2013 season. In a 1-0 walk-off win over the Detroit Tigers, he allowed just three baserunners on a walk, a hit by pitch and an error while striking out four and threw 99 pitches, 66 of which were strikes. Prior to reaching “The Show”, he earned back-to-back Futures Game selections in 2010 and 2011 and was named a Mid-Season All-Star in three consecutive seasons (2009-11). The righty spent the 2016 campaign in the Oakland Athletics organization, posting a 1-1 record with a 4.09 ERA in 11 starts across three levels. Alvarez was originally signed by the Blue Jays as an international free agent in 2007. Dunning reached the Major Leagues in 2013 and 2014 with the San Francisco Giants. He combined to appear in 30 games out of the bullpen and accrued a 2.77 ERA, yielding just eight runs in 26 innings while striking out 16 batters. The 28-year-old made his Major League debut on June 16, 2013 against the Atlanta Braves at Turner Field, tossing one scoreless inning of relief. Three days later, he recorded his first MLB strikeout, setting down the San Diego Padres’ Chris Denorfia in the eighth inning after taking over for Giants pitcher Madison Bumgarner. The Georgia native began the 2017 season in the Chicago White Sox organization, splitting time at Double-A Birmingham and Triple-A Charlotte. He posted a 2-1 record and picked up a save in 14 games (one start), striking out 23 batters in 24 and two-thirds innings. In 2016, the Indiana University alum appeared in a career-high 49 games with Triple-A Sacramento and struck out 43 batters in 59 and one-third innings. Dunning was originally drafted by the Giants in the 33rd round of the 2009 amateur draft.